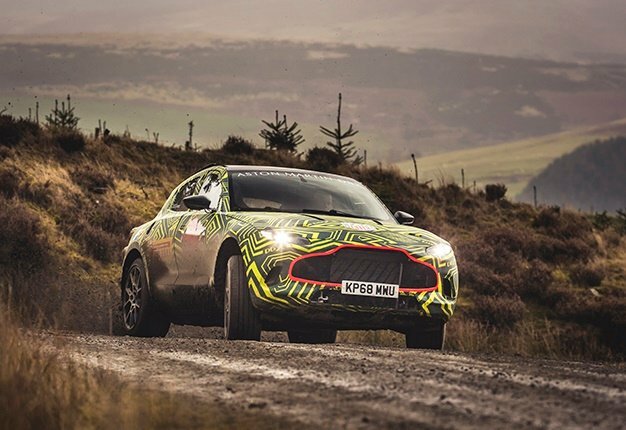 Aston Martin has made a significant and symbolic stride towards the luxury brand’s first SUV - now officially confirmed as the DBX - with the first development prototype being put through its paces along a demanding Welsh Rally stage in the hands of the company’s Chief Engineer, Matt Becker. Though simulation is an essential part of DBX’s early development phase, this first prototype drive in Wales signifies the start of ‘real world’ testing, in which the SUV will be subjected to a punishing regime that will ultimately see development prototypes of the all-new machine tackle some of the world’s harshest environments. From the frozen Arctic and scorching deserts of the Middle East to high Alpine passes and the high-speed demands of the German autobahnen and Nürburgring Nordschleife. The unique nature of DBX in the Aston Martin range means it requires a dedicated test programme; one that features new processes, procedures and standards that reflect its all-purpose role. So, while it will perform with the verve and poise of a true Aston Martin, its dynamic envelope has to extend into areas previously off-limits to the marque’s sporting roots. Naturally, this includes impressive multi-terrain and towing capabilities as befits a state-of-the-art SUV. "We have already developed and tuned DBX in the driving simulator, which has enabled us to make excellent progress in advance of the first physical prototype cars being available," speaking of his drive in the DBX development prototype, Aston Martin Chief Engineer, Matt Becker, said. "Still, it’s always a big day when you get to put the first actual miles on an early prototype and I’m delighted with the near perfect correlation between the simulator and this prototype. "As an engineer, it’s genuinely exciting to get a feel for the car you’re working to create. DBX is a very different kind of Aston Martin, but we will be testing it in all conditions and across all terrains to ensure it delivers a driving experience worthy of the wings badge," he added. "Seeing a DBX development prototype in action is a momentous chapter in the story of our first SUV, for it is the moment it really comes alive," Aston Martin Lagonda President and Group Chief Executive Officer, Andy Palmer said. "DBX is so much more than ‘just’ an SUV; it will be the first model built at our brand-new facility in St Athan. As such, it is very much the start of a bold new era in the company’s long history," he added.